Not sure exactly what just happened... I was saving up raid chips so I'd have 6-8k in the bank to do 3 attacks, to guarantee an alpha essence. 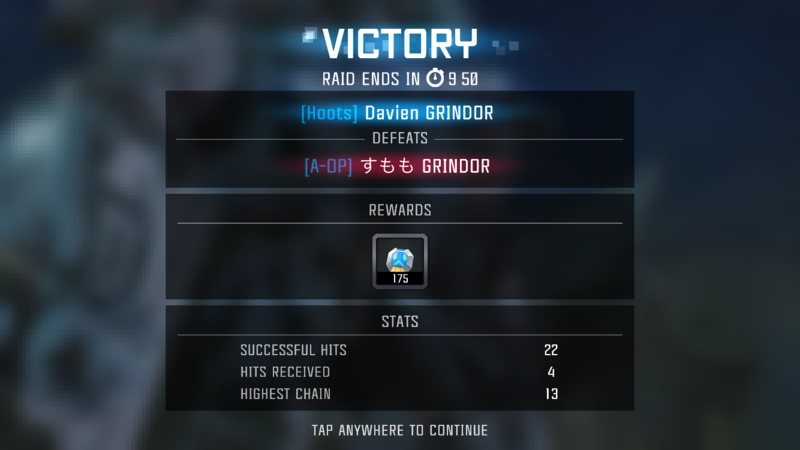 Logged in fresh and am somewhat amazed that I hadn't been raided, so I had 10K+ remaining... this should be easy. Just about to tick to 3/3 energy. 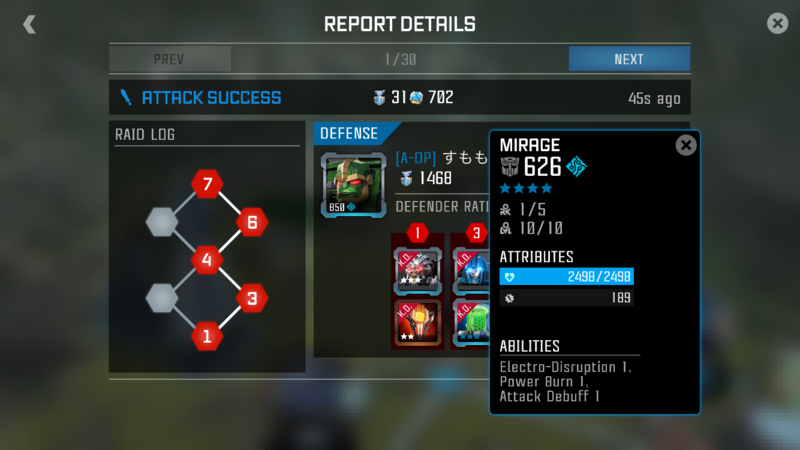 So I attack, attack a 6,500 opponent with 3k raid chip reward... score! I may actually be able to hit 18,000 with just one attack! Once the raid starts, my raid chips dropped to 5k... Christ, how many times did I get attacked??? But that wasn't the extent of the problem... 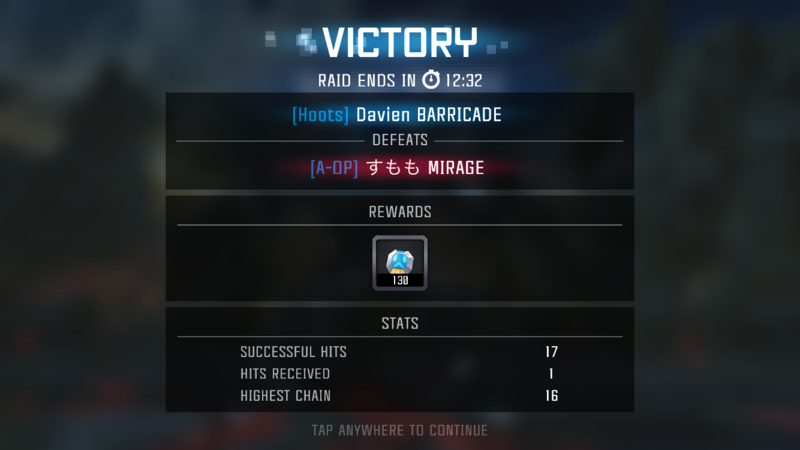 I succeed at the raid, all opponents around the 1k level, so I should have pulled about 4-5k + the 3K stolen... each fight however I was only getting like 120 raid chips. WTF. 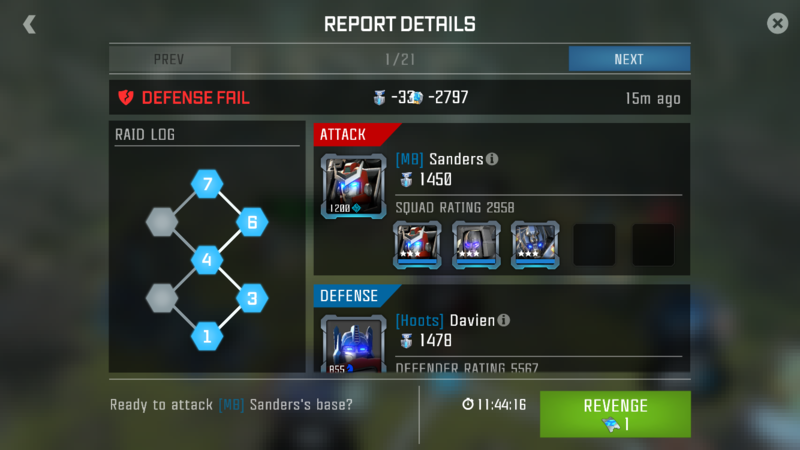 Happened all the way through, was getting rewards like I was fighting 1 star opponents. 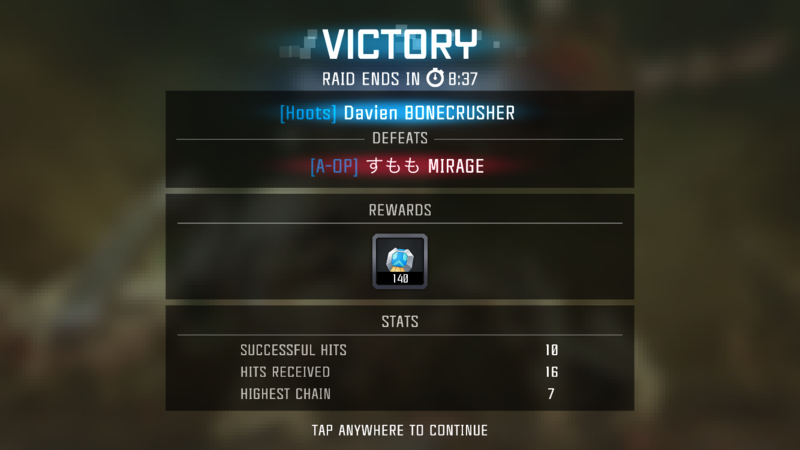 Then at the end of the raid, the stolen amount is way low too. 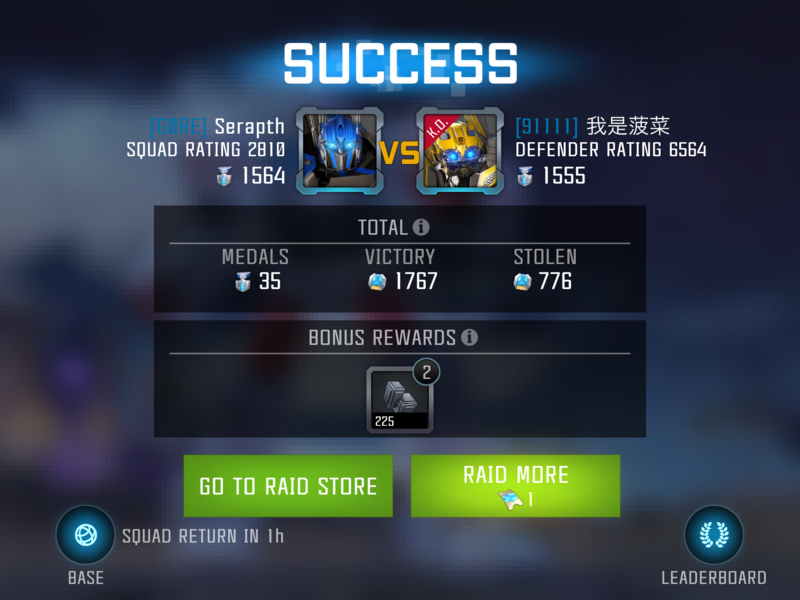 So, I started the raid over 10K chips, and ended it one energy poorer and with a net loss of 5k raid chips, even though I won. So yeah, a bug. Worse, now I don't have full energy and not a chance in hell of hitting the 18k number now. 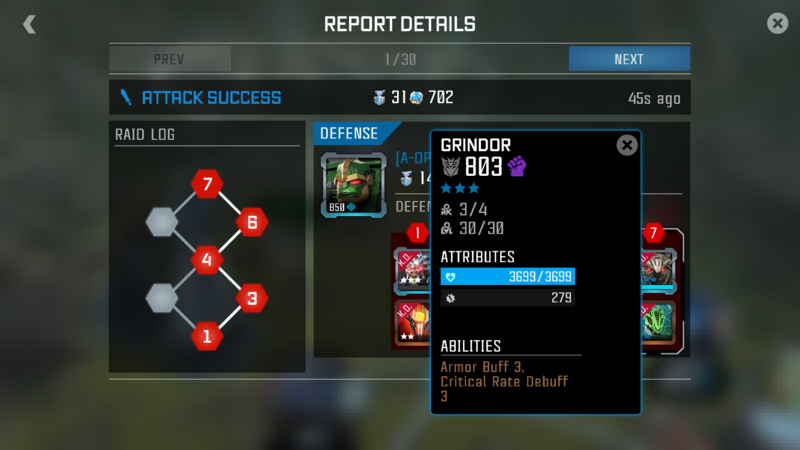 Even just the raw math of 6564 defender rating only giving 1767 chips proves something was wrong. I didnt screenshot the rewards obviously, as I hadn't expected it to bug out, it certainly wasn't 700. That I took a massive hit to my own stockpile of raid chips during the attack seems to compound the issue. Something was certainly off. Something is definitely wrong with the chips earned from raiding right now! Need this issue addressed asap!!!!!!!!!!!! ... and while I'm gaining nothing, I am losing chips at a staggering rate. Pretty much 100% loss from these two invasions, that showed after the fact by the way. Something is certainly broken... not going to bother trying to accrue anymore until this is fixed/addressed. Last pic is against Bonecrusher rated at 827. Please address this issue. 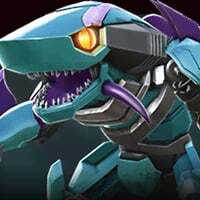 Free raid tickets for compensation? Yes, please.. pay my pain away Kabam! Seems to be working like it was before now.... thanks for fixing whatever was broken @Kabam! I don't think it was a fix, I think it's just intermittent. Trying to get to the bottom of what may have happened right now. I thought my mind was playing tricks on me. Thanks for posting this. This just happened to me too. 120 or so chips for battles against r3s and the bonus payout was supposed to be 4k but I only got another hundred something chips. Now every single time I'm attacked it's taking 100% of raid chips. Agreed, this one requires compensation, as this bug is literally stealing from players. To say nothing of not properly compensating them. I'm not even nothing for alpha essence this weekend as a result as it's just too frustratingly broken. Just raided a few more times and every base option had really high potential bonus rewards, like 4-5k, which is unusual. 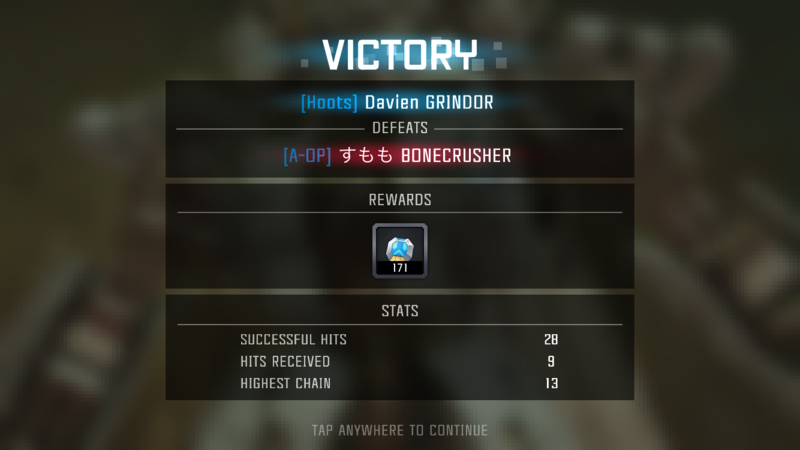 Each battle still only awarded 100 chips, but I did receive the bonus payouts. Still pretty wacked. I don't feel like spending energon to refresh. And did refresh, raided again and got nothing. No alpha essence for me tonight. All my 2.7k raid chips gone just after one raid!!! 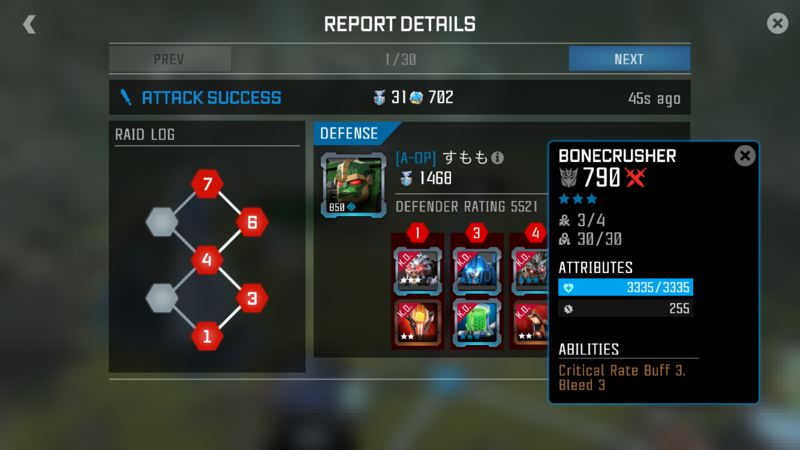 BS please compensate Kabam!! I raid a 5500 opponent with 3k chips. I win, end screen says everything is fine. Sweet, this should put me over my 18k... Go to buy essence... Not enough. Check history and the reward is only 400. 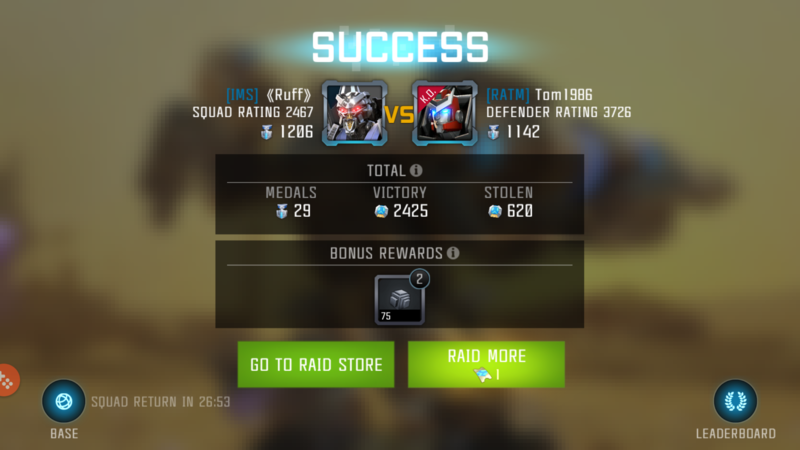 Something is seriously broken with raid rewards right now. 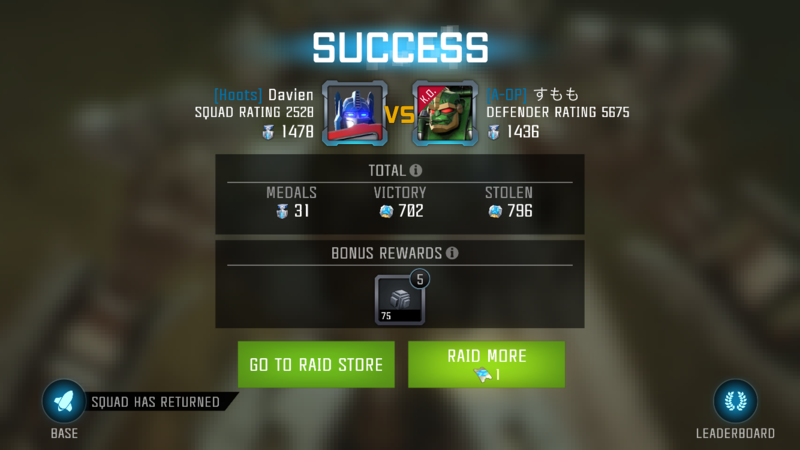 So pre and post fight say 3k plus stolen, history (and my raid credits) only get 400. The update looks great. Hopefully the loading screens before every match go away. But, this stuff is happening again. Just raided a couple of times and came away with nothing. Same here. 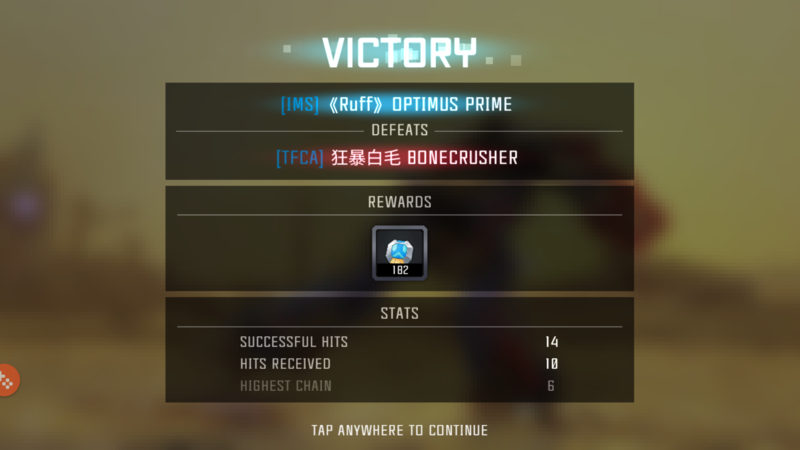 Beat bots with 700-1200 rating and getting fewer than 200 chips per fight. The payoff for completely beating the base is also still pretty low. 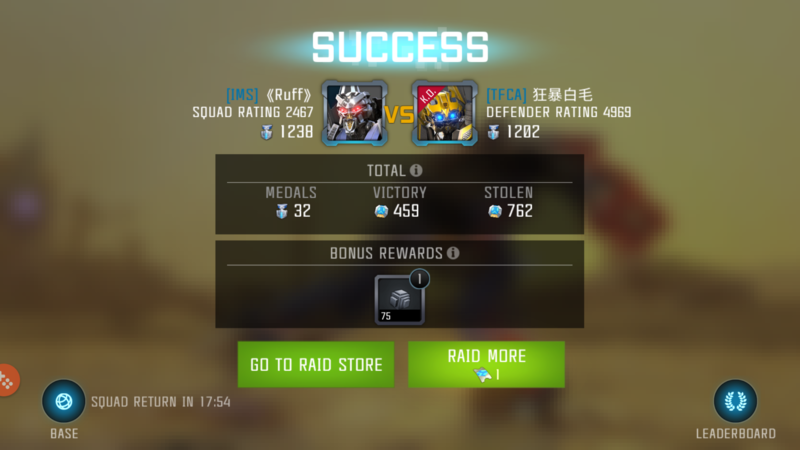 I had 2 successful raids and one failed. Got 5k chips total. 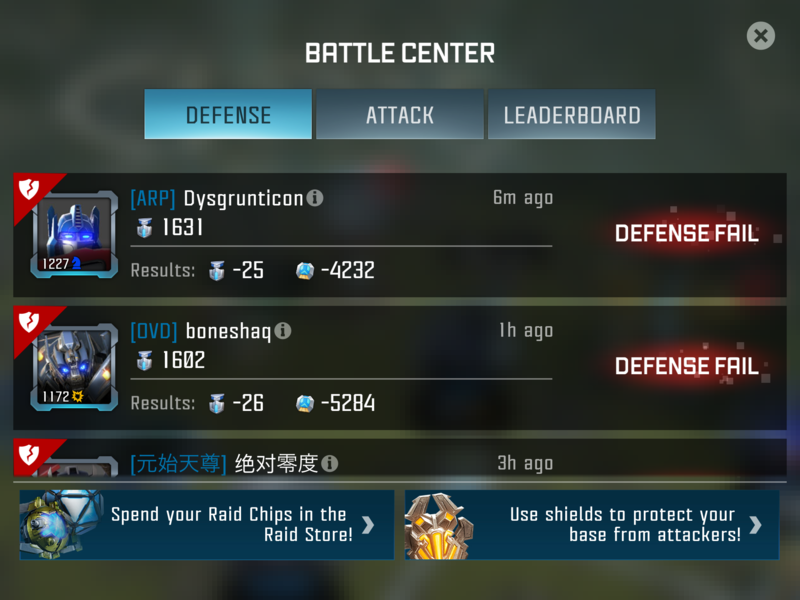 Lost 7k to other people raiding me at the same time though. Yay? 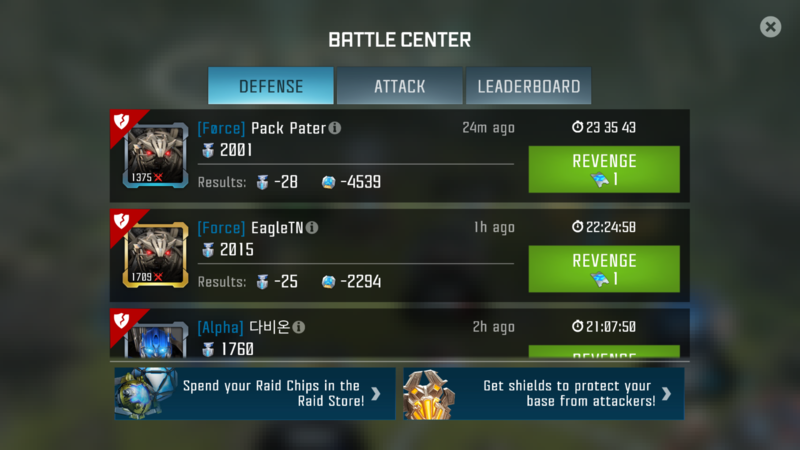 Yeah the reward numbers don't match up, even if you fail a raid you still get a victory reward, which is supposed to be the chips stolen from defeated opponents, right now it's not worth the effort to try and even take on a high level base because a 900-1000 wasp on laser guide will only get you 150 chips if you manage to beat it instead of the 900+ chips, this needs to be reworked.